The Moss Rose has hosted home to Macclesfield since 1997 and has a capacity just in excess of 6,000. The Silk FM stand runs along one side of the pitch and is a very small all seated stand with a number of terracing places down below. Opposite this is the Alfred Mcalpine stand which is very smart with no supporting pillars and excellent unobstructed views. 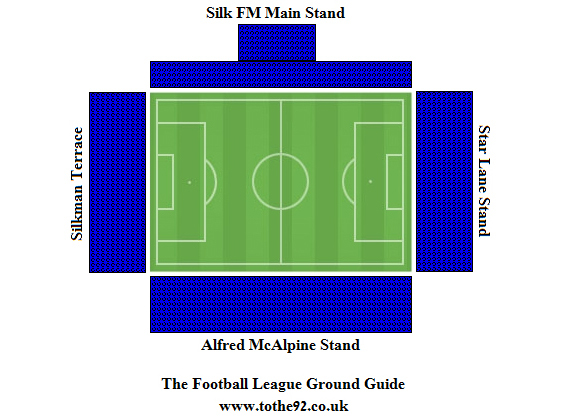 The Star Lane End is to the left of the Silk FM stand and is a covered seating and terracing stand, whilst opposite is the Silkmen End, which is an open terrace. Up to a maximum of 1,950 visiting supporters can be accommodated her and they are mainly located on the open Silkman End where up to 1,500 tickets are made available. A small amount of seating is also given over to visitors at the end of the Alfred McAlpine Stand. Most people prefer to sit these days but when you consider the terrace is open to the elements, it's not a bad idea to arrive early and get yourself a seat under the roof. Food includes burgers, hot dogs, chips and the rest of the football fare. The Moss Rose is a fair distance from the centre of Macclesfield and as such there isn't a wide selection of pubs or eateries. John Simpson tells me: An option is The Alexander Bar (named in memory of Keith Alexander) in the McAlpine stand which now welcomes home and away fans. It serves excellent hot and cold drinks as well as the usual bar snacks as well as showing the days early kick off's on a big screen tv. Also, they are child friendly. Parking is freely available in the streets surrounding the stadium. Arrive early to get a good spot, although the most you'll have is a 10 minute walk back to the stadium. Crowd congestion is very rare and therefore competition for spaces isn't there. The nearest / closest train station to Macclesfield Town's Moss Rose Stadium is Macclesfield. The railway station is approximately 25 minutes walk away so jumping into a cab may be the best suggestion. To walk: Exit the station and leave the main car park before turning left onto Sunderland Street. Follow this road along until you reach Mill Lane where you'll turn left. Continue to follow this road (which becomes London Road) until you reach the stadium up ahead on the right. We don't currently have any fans reviews from Macclesfield Town's Moss Rose Ground. To tell us about your experiences and to feature on the site, simply complete the fans review form below!